Conventional CCD detectors have two major disadvantages: they are slow to read out and they suffer from read noise. These problems combine to make high-speed spectroscopy of faint targets the most demanding of astronomical observations. It is possible to overcome these weaknesses by using electron-multiplying CCDs (EMCCDs). EMCCDs are conventional frame-transfer CCDs, but with an extended serial register containing high-voltage electrodes. An avalanche of secondary electrons is produced as the photon-generated electrons are clocked through this register, resulting in signal amplification that renders the read noise negligible. Two such cameras : QUCAM2 and QUCAM3 are now available for use on WHT/ISIS. A combination of laboratory measurements with the QUCAM2 EMCCD camera and Monte Carlo modelling, shows that it is possible to significantly increase the signal-to-noise ratio of an observation using these cameras, but only if they are utilised correctly. Even greater gains are possible through the use of photon counting. The recently released ING Technical Note No. 132 (Simon Tulloch, 2010) describes the performance of EMCCDs and presents a recipe for astronomers to follow when setting up QUCAM2 and QUCAM3 on ISIS which ensures that maximum signal-to-noise ratio is obtained. Schematic structure of the EMCCDs used in QUCAM2 and QUCAM3. Photo-electrons produced in the image area are vertically clocked downwards, first into the storage area, and then into the 1056-pixel serial register. 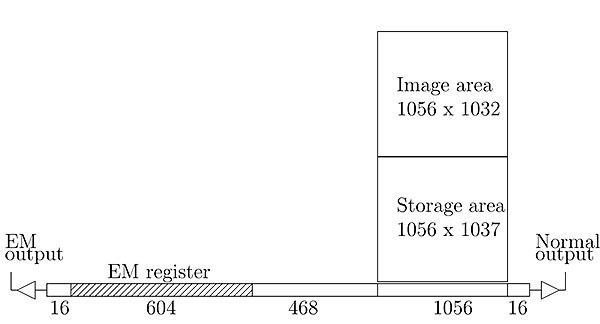 For EMCCD operation, the charge is then horizontally clocked leftwards, through the 468-pixel extended serial register and into the 604-pixel EM register, before being measured and digitised at the EM output. For conventional CCD operation, the charge in the serial register is horizontally clocked rightwards to the normal output [ JPEG ]. S. Tulloch, 2010, ING Technical Note, 132. S. M. Tulloch, V. S. Dhillon, 2010, "On the use of electron-multiplying CCDs for astronomical spectroscopy", MNRAS, accepted for publication.